I semi-recently picked up a mini Butter London. It reminded me a bit of the failpolish from Color Club. I posted a picture of the Butter London on instagram, and it was suggested that it might be a dupe for Kleancolor's Metallic Red as well. Since I returned the stinky failpolish a long time ago, I decided I would compare it to the Kleancolor. They don't look at all alike in the bottle. 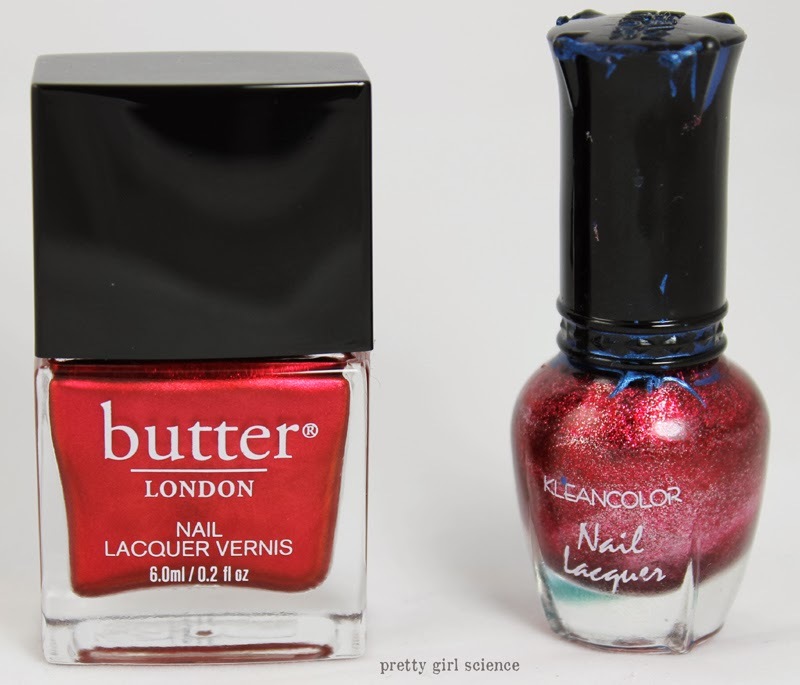 The Butter London is a proper satin (like the Zoya Satins) and is a more even-looking color. The Kleancolor is misleadingly silvery in the bottle. At first glance, they look absolutely nothing alike. Once they are on, any question that these could be dupes goes right out the window. The only thing they have in common is that they are both red. The similarities really stop there. Knees Up is a satiny cherry red. It's pretty sheer, and needs at least two coats, even on the shortest of nails. It thankfully doesn't need much blotting like some satiny colors do, the application of topcoat will smooth out most of the streaks. It is a lovely color, and perfect for the (now over) holidays. 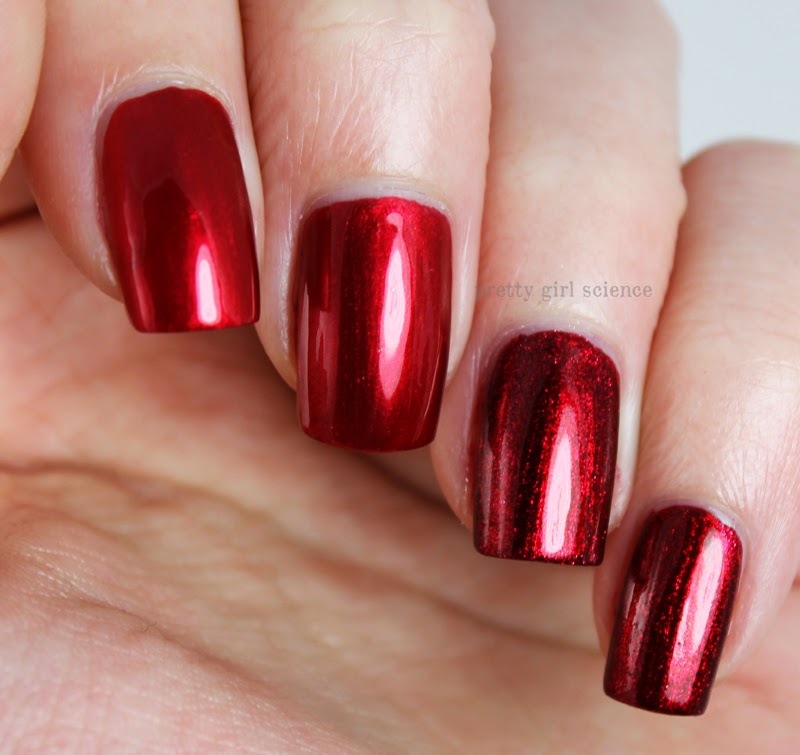 Metallic Red is a deep, shimmery red. The metallic factor gives it an almost black undertone, especially in person. It is super thick, and can be a little gloopy. I needed 2 coats, but that was only because it likes to move around. It would definitely benefit from a good blot or three. Lastly, the smell. Is it all Kleancolors, or just the minis? It's awful and lingering. Almost all the polishes I have from this brand have been swaps, and the smell makes me glad that I never purchased any at full price. TL;DR is that these are not dupes. If you need a red polish that isn't a cream...then either one will do for you. But if you are looking for something with a satiny finish and an easy application method...grab Knees Up. The best use for Kleancolor Metallics is stamping, tho' watch out for smearing when applying top coat. really? I've never tried them!